The fourth installment in the best-selling open-world racing game series developed by Playground Games. The game takes the players to the UK, where they can compete in various races while driving over 450 different cars. 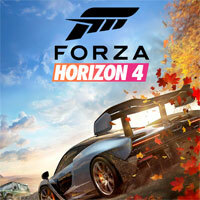 Forza Horizon 4 is the fourth installment in the best-selling open-world racing game series developed by Playground Games. Similarly to its predecessors, Forza Horizon 4 gives players at their disposal a vast open world. After Colorado in the US, the Mediterranean Sea and Australia featured in previous installments the time has come for the United Kingdom to host the Horizon Festival races, where players assume the role of a racer who wants to become the star of the aforementioned festival. The game offers the biggest in the series' history selection of cars – players can collect, modify and upgrade over 450 cars of over 100 brands. All of these vehicles can be adjusted to particular races and weather conditions. Players can also influence the vehicles' cosmetics to fit their preferences. Among all those vehicles, there are exotic supercars (including McLaren Senna from the cover), off-road vehicles and icons of world motorization. Players can also change the appearance of their drivers by changing their clothes and accessories. Moreover, one can also purchase real properties that unlock certain benefits. Apart from regular races, the game offers other types of competition featuring time challenges and spectacular events, during which players race against motorcycles or airplanes. Moreover, the game introduces a number of changes to gameplay mechanics, the most prominent one being seasons of the year changing every week. They affect the weather, day and night length, as well as the conditions on the track. For example, in Fall the roads are usually wet which works against traction. In Winter, on the other hand, lakes freeze over resulting in handy shortcuts. Forza Horizon 4 features both single and online multiplayer modes. Players can now set their own racing tracks and share them with others participating in the given race. Forza Horizon 4 is based on the same technology its predecessors. On Xbox One X and more powerful PCs, the game runs at 4K resolution. Moreover, the console version supports 60 fps (however only at 1080p).